A nice collection of stories and information on classic and modern horror. Lots of trivia and interesting details that might be appreciated mostly by horror fans (and I am one of them). However, I would mostly see it as a 'passatempo' book rather than something I would highly recommend. Loads of interesting information and great pictures. I loved the lists - like body count per slasher film - and facts I never knew about actors like Vincent Price. This could have used another round with an editor's pen, though. The grammar sometimes left a lot to be desired. Overall, a book I'd recommend! Really nothing to say here, it was a nice little collection of facts, some that i did't know, some that i didn't know, some that i did. An excellent horror primer. It covers film, books, games and everything in between. It's great for the horror fan who is looking for more content in the genre. A great little read. The kind of book that leads you to a lot of other great books...and movies...and so on. Highly recommended. Be ready, before you start reading, for the moments when the prepositions and articles start disappearing from the sentences, as if author were lapsing into syntax from old country. Don't know what that's about! Really nice compendium of lists for the horror buff. It's a short read and there are many things within that I already knew. However as a fan of this genre I found it to be wide ranging and informative. 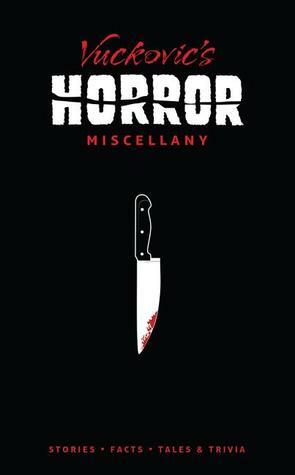 A really fun read if you're a fan of horror. Jovanka Vuckovic - Jovanka Vuckovic is an award-winning writer, artist, film critic and cinema historian. She spent five years as a digital effects artist at CBC Television, where she earned a Gemini Award for Best Visual Effects. She became a noted horror genre expert during her tenure as Editor-in-Chief of Rue Morgue Magazine and was recently named one of the top thirteen most important women in the history of horror alongside Mary Shelley, Kathryn Bigelow and Vampira. Vuckovic is the author of Zombies! An Illustrated History of the Undead (due out February 2011 from St. Martin's Press/Ilex Press). She is currently directing her first film, The Captured Bird.